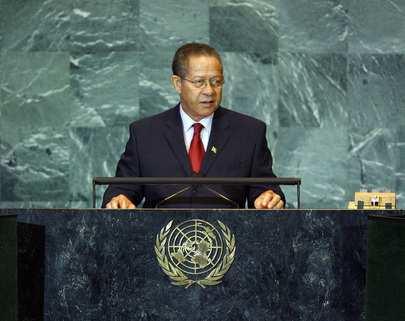 UNITED NATIONS, August 27 -- While the IMF states publicly that it no longer engages in conditionality, it is reportedly requesting as a condition for loans significant budget cuts in Jamaica, as well as Serbia, St. Lucia and the Maldives. 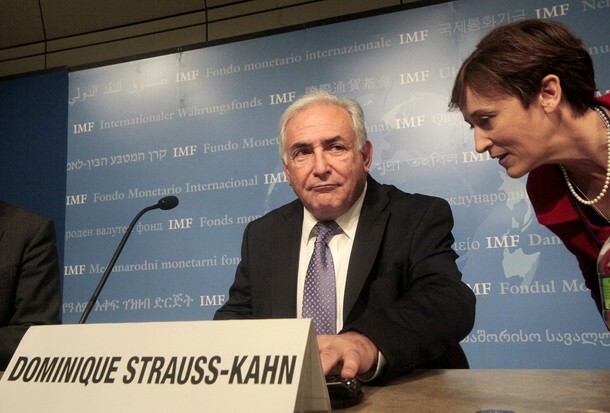 At the IMF's forthnightly briefing on August 27, Inner City Press asked IMF Spokesperson Caroline Atkinson about "what's seen as the IMF dictating cuts in government spending as a condition for a loan... Please confirm what changes are being requested by the IMF." Video here, from Minute 9:18, IMF's transcript below. Ms. Atkinson replied that there are "discussion between the IMF and Jamaican authorities" and argued that the "authorities are designing the macro economic program... they are in the lead on." She said "I don't want to go into a discussion of particular issues." Then she ignored Inner City Press' request, in the same question, for answers on the Maldives, and on Serbia at the provincial level. The requests or "macro economic programs" done which negotiating with the IMF look suspiciously similar, and undercut the argument that each government is really in charge. The governments also try to avoid questions of how they have given in to the IMF. Last week Jamaican Prime Minister Bruce Golding, speaking at the opening of a new financial center for the Scotiabank Group in the Jamaican capital, refused to say "whether the cuts were required by the International Monetary Fund as a condition for borrowing $1.2 billion to stabilize its budget under the multilateral lender's special drawing rights." Is this the new IMF? 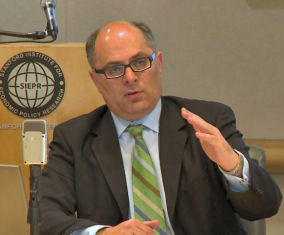 Similarly, in a question submitted during the IMF briefing but ignored (or censored), the IMF played a wheeler-dealer role in the Democratic Republic of the Congo and its mining sector. Inner City Press asked, in writing, "did the IMF's suggested changes in the country's mining deal with China result in any offsetting changes in China's commitment to Congolese infrastructure development? Is the IMF involved in or did it consider the DRC's proposed Inga Dam?" At the IMF's request, the DRC cut its guarantee of income from the mines to China, in connection with which China cut its investment commitment from six to three billion dollars. As one analysis interviewed by Inner City Press put it, DRC will now borrow money from the IMF instead of taking it from China. The analysis describe the IMF as doing European powers' work for them, trying to ween a country away from China. The dam named above will reportedly supply power to southern Europe, from a region where than 30% of the population has electricity. This is the new IMF? Watch this site. I have a question online about Jamaica. It's asking, "In Jamaica there are protests about what's seen as the IMF dictating cuts in government spending as a condition for a loan. Please confirm what changes are being requested." As you know, there are discussions that have been underway with the IMF and the Jamaican authorities. The authorities themselves are designing their macroeconomic program and that is something that they are very much in the lead on. I don't want to go into discussions about particular issues and I think that we've been having good discussions with the authorities. We are impressed by the fact that they are taking measures and considering measures and have committed as it is very important as we've been stressing recently to a program that will be very much their program. As IMF Waives Pakistan Bank Law Not Power Subsidy Deadline, Conditionality Cut Only in Name? UNITED NATIONS, August 10 -- On August 7 the International Monetary Fund's executive board approved additional funds for Pakistan, up to $11.3 billion, explicitly waiving a previously condition that more stringent bank supervision legislation be enacted. Also waived, or excused, was Pakistan's delay in complying with a commitment to eliminate power subsidies, In a media conference call late on August 7, Inner City Press asked the IMF's head of mission to Pakistan Adnan Mazarei about the two waivers. He acknowledged both, but insisted that the IMF no longer engages in conditionality, and therefore there was no formal vote on the continuation of power subsidies. The bank supervision commitment, it seems, comes from another time. But if both commitments were sought, is the IMF's claim to no long engage in conditionality just a semantic difference? What really has been changed? Inner City Press: I see in the press release that the Board granted a waiver to legislative amendments to increase the effectiveness of bank supervision. I wonder if you could say if that’s extended for a particular period of time. And, also, I did not see any mention of this power subsidy. I thought that IMF had asked that that be eliminated by July 1. At least it has been reported some places that that is, but I do not see it in the press release. I also saw an article about the consolidation of ministries in Pakistan, including the Ministry of Human Rights is somehow being something directed by or requested by the IMF. Can you comment on that? MR. MAZAREI: Let me start with the last question on the consolidation of ministries. I think it is very good for a government to be lean and mean in this administration, but the Fund has had nothing to do with that particular recommendation. We do not micromanage government organizations; we make general recommendations about the level of spending. We do not get involved in how many ministries government should have or not. On the issue of electricity, electricity sector, as you are aware, is a major drain on the economy of Pakistan. Because of ongoing recurrent blackouts, GDP growth and manufacturing output and generally welfare of consumers is very much undermined. At the same time, because of well-known and long-lasting problems of areas of customers not paying the power companies, the government putting in place price limits on electricity, which has created also some financial problems with electricity sector, investment in power and energy in Pakistan has been very low. The World Bank and Asian Development Bank have recently agreed with Pakistan on a set of measures to help improve the finances of the electricity sector, taking care of the problem of inter-enterprise areas, which is in Pakistan known as circular debt. At the same time, the Asian Development Bank and the World Bank have agreed with the Pakistani authorities on possible increases in electricity prices in the period ahead such that by August of next year, electricity tariff differential subsidies will be eliminated. You are absolutely right that the authorities had intended to eliminate the subsidies by last July, but because of political considerations, because of social issues, these increases have been delayed. Now, on bank supervision, you are absolutely right. The authorities had indicated that they would like to increase the powers of the Central Bank in the area of bank supervision, but they have been delayed in implementing this, and they are going to do this by September 1, hopefully. And the waiver doesn’t have a time limit, but the authorities have committed to do this, and in a short while from now, and that should be okay. Inner City Press: Could I just ask was there not a waiver given on the power subsidy or was the commitment made by the government not as sort of binding, or does the press release just not contain all the waivers that were given? MR. MAZAREI: There was no conditionality on the electricity sector. What we put down officially as performance criteria, which we will not have anymore going here forward because policies in this area have changed, used to require waivers. Now, the reason there was no waiver for electricity, as I said, was because there was no formal conditionality on this. And this area, the issue of electricity is formally in the domain of the World Bank. We are interested in it by and large by of its criticality in terms of macroeconomic policy for the government finances and for growth. UNITED NATIONS, July 27 -- While the International Monetary Fund speaks of its transparency, and the government of Sri Lanka brags about releasing its Letter of Intent to the IMF, the Technical Memorandum of Understanding for the IMF's contested $2.6 billion loan to the Rajapakse regime is still being withheld, and the IMF won't even confirm that the abstention of the UK, France, Germany, Argentina and U.S. from Friday's vote on the loan. Inner City Press asked IMF spokesman William Murray to "state which countries abstained or vote against the $2.6 billion loan to Sri Lanka on Friday, or to explain why such basic information on voting on a loan of this size is not routinely made public." The IMF's Murray replied, "On Board votes, it is their policy to refrain from formally disclosing specific votes." What kind of transparency is this? 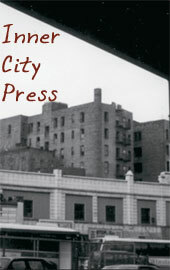 Inner City Press also asked Mr. Murray, "how were reporters who cover the IMF and/or the loan to Sri Lanka informed about the conference call with [head of IMF mission to Sri Lanka] Brian Aitken?" Murray replied that "that was a briefing with reporters in Colombo." At three IMF press briefings this year, Inner City Press has asked about Sri Lanka's application for a $1.9 billion loans. In March, asking in person in the IMF's briefing room, Inner City Press was told that conditions were being negotiated by the IMF's mission to Sri Lanka. After that briefing, Inner City Press was approached by IMF communications staffer Yoshiko Kamata, who committed to keep Inner City Press informed. At two subsequent IMF briefing, the IMF's Caroline Atkinson told Inner City Press that the loan was only for the Central Bank, and that international views would be considered. Then the loan was approved, Mr. Murray declined to confirmed which countries abstained, and Ms. Kamata set up a media conference call in Washington DC about the loan without informing or inviting Inner City Press. 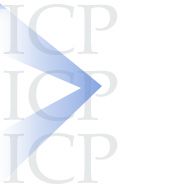 UNITED NATIONS, July 25 -- Only after procuring approval of a $2.6 billion loan from the International Monetary Fund Executive Board did the Sri Lankan government, under pressure, put online a copy of its July 15 Letter of Intent to the IMF. Contrary to claims that the purposes and IMF debate around the loan had nothing to do with the detention camps and relocations in Northern Sri Lanka, the Letter of Intent describes use of funds for the camps, and states that "the government aims to resettle 70-80 percent of IDPs by the end of the year." When UN Secretary General Ban Ki-moon belatedly visited Sri Lanka and the Manik Farm internment camp in late May, the government said it would release 80 percent of those being detained by the end of the year. The July 16 letter to the IMF -- withheld until after the July 24 vote on the loan -- dropped the percentage to seventy. In fact, before the IMF board voted but also before it was publicly acknowledged that the release of detained Tamils was part of Sri Lanka's letter of intent to the IMF, Sri Lanka's foreign minister had already further dropped the percentage, to sixty. 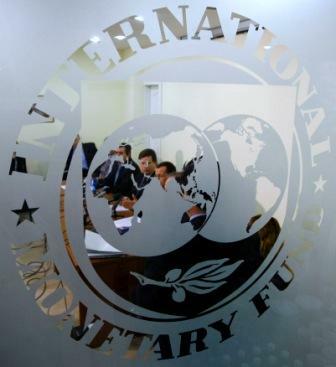 Some now say that the IMF board on July 24 voted on old and inaccurate information -- which was allowed only because the IMF and Sri Lanka withheld the July 16 letter until after the $2.6 billion had been voted on. Inner City Press: Since it was said that the Secretary-General was closely monitoring the compliance with the joint statement and all of this, it’s just come out that the Foreign Minister of the country has now said that the commitment made, including while the Secretary-General was there, to allow 80 per cent of those in the detention camps to return home by the end of the year no longer holds, that it’s going to be a lower number. Has the UN taken note of that and what’s the response to that? Associate Spokesperson Haq: We have always expected the Government to abide by the commitments that have been reached on this particular matter. Beyond anything further, I’d check whether OCHA has new reaction to the latest comments. I don’t know whether we necessarily would react to the very latest comments that you just cited, though. Then prior to the IMF vote, but before the letter to the IMF was released, the government gave itself space to continue to detain some additional 30,000 to 60,000 people past the previously committed deadline. The UN has nothing to say, and the IMF is giving $2.6 billion to the government. Some call it an IMF reward for the extended detention of political prisoners -- apparently the IMF would look favorably on the internment -- and opacity or delayed release -- practices of Myanmar and North Korea. Watch this site. IMF footnote: the belatedly released Sri Lankan Letter of Intent to the IMF about the loan puts in a different light the IMF Director of Communications' public May 21 response to Inner City Press' questions about IDPs and relocation, that "perhaps it's just helpful to clarify that when the IMF lends, it is not for specific projects. We lend to support a country's finances. We make a loan to the Central Bank to support reserves." Then why was the following in Sri Lanka's Letter of Intent to the IMF, withheld under after the IMF vote? Reconstruction of the North and East and the protection of vulnerable groups adversely affected by the conflict will be an integral part of our program. To this end the government has moved quickly to provide humanitarian assistance to those affected by the conflict and to develop a post-war reconstruction plan. The immediate priority is addressing the humanitarian needs of the estimated 280,000 internally displaced persons (IDPs). The government aims to resettle 70-80 percent of IDPs by the end of the year...In 2009 the government intends to make room within the programmed deficit targets for spending on humanitarian assistance and the resettlement of IDPs using savings in existing budget provisions, redeployment of certain categories of military personnel for demining and for the provision of basic infrastructure, and any external grants from our development partners. About two percent of the projected government spending will be used for the provision of humanitarian assistance and the resettlement of displaced persons. A needs assessment is expected to be completed by end July 2009 to determine additional funds needed for the broader reconstruction strategy. 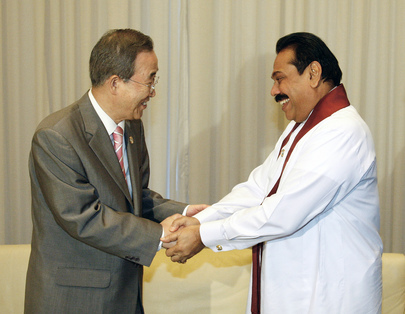 UNITED NATIONS, July 24, updated -- As the International Monetary Fund's executive board approved a $2.5 billion loan to Sri Lanka, the IMF refused to release a copy of the Rajapakse government's letter of intent for the loan. As far back as a March press briefing in Washington, Inner City Press asked the IMF what safeguards, if any, would ensure that the IMF funds not boost the Rajapakse government's shelling and now detention of civilians in northern Sri Lanka, and alleged ethnic cleansing there. "Will check on the Letter of Intent. They're released by the member country, and typically after Executive Board review of the economic program. 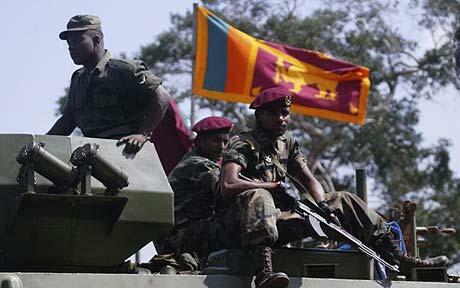 Sri Lanka's board meeting is today." "The publication of the Letters is governed by the Executive Board's transparency policy. That policy empowers the member country to decide whether to release the document or not." But the policy states that the country's consent to publication by the IMF is "presumed." So why is the Sri Lankan letter not made public by the IMF? In fact, long after Sri Lanka's Ambassador to the U.S. had publicly announced the IMF's approval, which he said no one opposed, Mr. Murray at 5:49 p.m. Friday told Inner City Press to "stay tuned" about the IMF's Sri Lanka decision. While the Times of London reported that the UK would vote against the loan, the UK has only a five percent say. At press time it appeared the UK, France, Germany, Argentina and the United States abstained on the loan, an "IMF source" was quoted. How can the IMF let an applicant country scoop it on announcing a loan, while allowing the country to withhold its letter of intent? Update -- long after deadline for this article and after Sri Lanka already announced the IMF's approval, the IMF put online a press release (no further communication was received from Mr. Murray) putting the size of the loan even larger, at $2.6 billion. 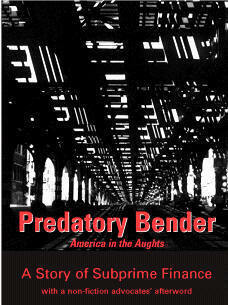 Analysis will follow, watch this site.